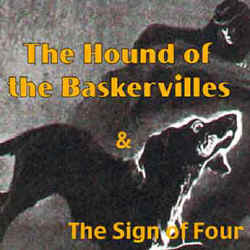 Audiobook - The Hound of the Baskervilles by Sir Arthur Conan Doyle, published in 1901 and read by Patrick Horgan. Format mp3 files by chapter ~ 301 MB zip file. This work, published by Arthur Conan Doyle in 1901, occupies a central place in the Canon of Sherlock Holmes stories, falling between the much mourned death of the hero in 1891 (reported in 1893) and the presentation of his triumphant return in 1903. Doyle emphasized that this book was a reminiscence rather than a resurrection, but it has peculiar features which suggest that it could be more than that. The fact that the great detective is apparently missing for six of the fifteen chapters would surely make a reader of that time connect this absence with the one he had been bemoaning for the last eight years. He might derive some comfort from the fact that the villain of this book, Stapleton, goes to a watery grave in Grimpen Mire, and Holmes himself is rescued in the nick of time from a similar fate. Does this mean that he may have escaped from his watery death at Reichenbach Falls? Be that as it may, this work has by far the strongest writing and character development of the four books Doyle wrote in novel form. It has been the basis of several popular movies.